In 1994, Dan Gifford and I wrote that “D-Day was almost a German holiday.” That is, in the darkest days of the war, defending U.S. coastal areas was a crucial concern. Fortunately, the states were able to call forth their self-armed citizen militias for coastal defense, while the U.S. Army and National Guard were busy elsewhere. From the events of 1774-75, we can discern that import restrictions or bans on firearms or ammunition are constitutionally suspect — at least if their purpose is to disarm the public, rather than for the normal purposes of import controls (e.g., raising tax revenue, or protecting domestic industry). We can discern that broad attempts to disarm the people of a town, or to render them defenseless, are anathema to the Second Amendment; such disarmament is what the British tried to impose, and what the Americans fought a war to ensure could never again happen in America. Similarly, gun licensing laws which have the purpose or effect of only allowing a minority of the people to keep and bear arms would be unconstitutional. Finally, we see that government violence, which should always be carefully constrained and controlled, should be especially discouraged when it is used to take firearms away from peaceable citizens. Use of the military for law enforcement is particularly odious to the principles upon which the American Revolution was based. UCLA Professor David Hayes-Bautista explains the 1862 origins, an all-American holiday created by Mexican-Americans, who saw the Mexican victory against the French attempt to destroy Mexican democracy as another front in the Union’s battle against the Slave Power. The New York Times has up a post by Philip Kitcher, John Dewey Professor of Philosophy at Columbia University, on Social Darwinism. Kitcher is eager to reach the conclusion that the GOP’s budgetary policies are “Social Darwinist”, and in service to that agenda, or perhaps because his research on the matter isn’t up-to-date, her presents an extremely simplistic version of the history of Social Darwinism that’s right out of Richard Hofstadter’s influential but dubious 1944 work Social Darwinism in American Thought. As an antidote, I recommend reading Thomas C. Leonard’s excellent essay, Origins of the Myth of Social Darwinism: The Ambiguous Legacy of Richard Hofstadter’s Social Darwinism in American Thought. The short version: our current concept of “Social Darwinism” has a lot less to do with what intellectuals of the late 19th and early 20th century actually believed–Progressives often broadly fit the category of “Social Darwinist”, libertarian types less so than is commonly believed–and more to do with the Hofstadter’s ideological agenda of supporting Progressive economic reform (Wikipedia quotes him as saying, “I hate capitalism”) while undermining the case for using biology in the social sciences. Speaking about the need to develop new sources of American energy in Largo, Md., Obama used our 19th president to illustrate a failure of forward-thinking leadership. The telephone quip is often attributed to President Hayes, but it turns out to be completely false — a “four pinocchio” falsehood. 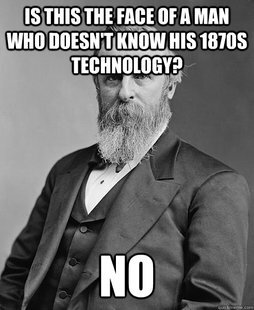 As New York reports, historians have a different view of the 19th president who, it turns out, was quite taken by the telephone and quite supportive of new technologies. In addition to the scores of specific words and phrases dissected in Lawtalk: The Unknown Stories Behind Familiar Legal Expressions, we also discuss more generally what may be the most ridiculed characteristic of legal language — its predilection for redundancy: “aid and abet,” “over and above,” “goods and chattels,” “ordered, adjudged, and decreed,” and so on and so forth. In law school it was explained to me that this was the result of combining words from Old English (like goods) with substantially synonymous words of French origin (like chattels) to assure comprehension in an age in which both languages were used in England, particularly in legal contexts. But this common explanation doesn’t hold water. Aid and abet, for example, are both from French; over and above are both native English. In Lawtalk we point out a number of considerations that fostered — and in many cases still foster — the use of such phrases, such as the fear that omitting some customary word would open the door to an argument that some shade of meaning is not covered. A factor now mostly forgotten is that for centuries court clerks, and even some lawyers, were paid by the page — an approach unaccountably neglected in the search for alternatives to billing by the hour, about which Beth Thornburg wrote in this space two days ago. And we emphasize an even more overlooked factor: that the use of redundant expressions is not specifically a lawyerly habit, but a common stylistic feature of general English, sometimes adding gravity (e.g. wrack and ruin) and sometimes whimsy (jot and tittle).